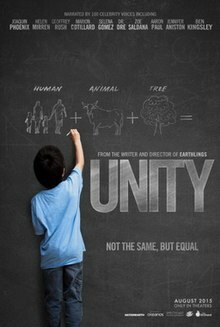 Unity is a 2015 documentary film written, directed and produced by Shaun Monson, and the sequel to the 2005 film Earthlings. The film is narrated by one hundred actors, artists, athletes, authors, businessmen, entertainers, filmmakers, military personnel and musicians. The film was released worldwide on August 12, 2015. The title "Unity" signifies the intention of the content. It's not so much to entertain, like a past-time, but rather turn something "on" inside you that has been suppressed or forgotten by the mask that society or tradition puts upon us. But more than that the film also helps relate us to the mystery of existence, to all of existence, which we are merely a part. Unity is a documentary that explores humanity's transformation, presented in five chapters: "Cosmic", "Mind", "Body", "Heart" and "Soul". On June 26, 2013, Shaun Monson started a Kickstarter campaign to complete and market the film, with the goal of reaching "a minimum of $800,000 to complete post-production and release the film within a year", but the fundraising was unsuccessful. After Monson's first installment, Earthlings (2005), he spent roughly seven years developing, writing and producing Unity. The film is produced by Monson and Melissa Danis with Nation Earth and will be distributed by SpectiCast and Fathom Events. The film was also recorded as an audiobook read by Monson. The audiobook is an unabridged version of the Unity script and is about five hours long. ^ a b c d e f g Dave McNary (April 22, 2015). "Documentary 'Unity' Set for Aug. 12 Release with 100 Star Narrators". Variety. Retrieved May 1, 2015. ^ "Film Unity". Yuko Sonoda Official Site. July 12, 2012. Retrieved January 17, 2014. ^ a b "Shaun Monson - Unity Interview". Vegan Publishers. July 23, 2013. Retrieved January 17, 2014. ^ a b c "100 Celebrity Narrators, 7 Years In The Making ..."Unity" To Screen In Cinemas Worldwide Beginning August 12". PR Newswire. April 22, 2015. Retrieved May 1, 2015. ^ "UNITY (15)". British Board of Film Classification. June 17, 2015. Retrieved June 18, 2015. ^ a b c "About - Unity". Unity the Movement. Retrieved January 17, 2014. ^ "Cast - Unity". Unity the Movement. Archived from the original on December 9, 2013. Retrieved June 27, 2013. ^ "UNITY THE MOVIE by Shaun Monson — Kickstarter". Kickstarter. June 26, 2013. Retrieved June 27, 2013. ^ "New Audiobook 'Unity' explores Consciousness and Connection". Edge Magazine. July 1, 2009. Retrieved January 17, 2014.